By Marshal Panda: The judicial review board of Punjab (Pakistan) having the Lahore High Court judges on the panel, ordered the release of the Mumbai attack master mind Hafiz Saeed from house arrest.. Many angry words and indignation were heard here in India over his release. But, does not the buck stop here? Mistake lies with us for having trusted the Pakistani judicial process to punish a proclaimed terrorist. It is the same judiciary which routinely endorsed the military takeover of governments in Pakistan on the ‘doctrine of necessity’. No amount of evidence supplied by India was enough for the prosecution there. Immediately after the release, the ‘innocent’ proclaimed that he was detained only due to the US pressure on Islamabad and India had motivated the US for the same. No evidence existed against him. He declared that he will work for the cause of the freedom of Kashmir and mobilize people in Pakistan for that cause. US stance seems hollow here. US citizens too were killed in the Mumbai attack and this imposes obligation on the authorities there to apprehend the culprit. US too had put a bounty of a crore of dollars on his head. But, the US is not prepared to punish Pakistan as on today due to its own compulsions. The real reason lies somewhere else. Pakistan has fought four wars with India and three of them exclusively over Kashmir. In each war, it was defeated. Snatching Kashmir away from India by way of force never worked for Pakistan. Now the Indian security forces in Kashmir have been largely successful in containing the current phase of terrorism. The elimination of terrorists has almost reached the double century mark this year. Indian army has dominated over the LOC. Along with these, the relentless NIA pressure has almost dried up the funding sources. Even the stone pelting has been reduced to manageable levels. Pakistan finds it increasingly difficult to push terrorists across the LOC in to the valley. Those inside the valley are hard hit finding places to hide. So fodder for the Indian guns must be arranged. 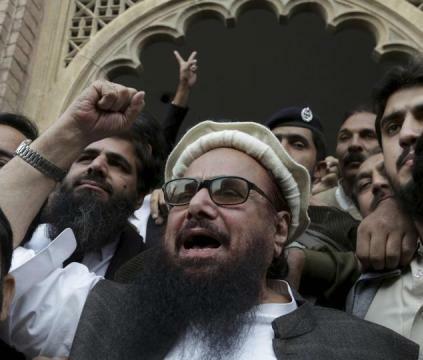 And who is better than Hafiz Saeed to rouse the rabble? That is why his statements seem to emanate from the GHQ Rawalpindi! And for us, either we deal directly with the ‘problem’ called Hafiz Saeed or suffer silently.